There is a free National Trust car park on top of the hill overlooking Ringstead Bay. From the car park there are great views over the bay to Portland and Burning Cliff. Illustrated sign boards show paths and locations. View the larger Google map below to see locations, paths and places of interest. 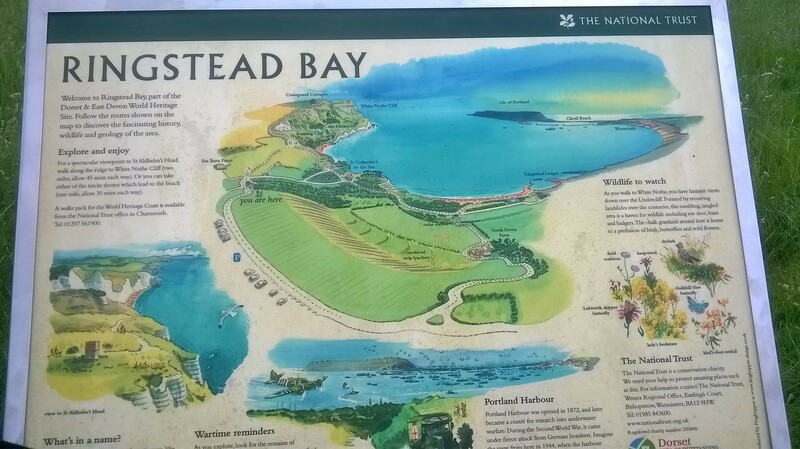 Zoom out to see how to get to Ringstead Bay. There are some steep climbs on the paths up and down from the bay. Alternatively there is private pay car park by the café (kiosk) right down in the bay. You can always take a comfy chair and a flask and just sit on the hill to enjoy the views. Walking down past the farm you find the old RAF Radar Station. The area features as part of the Channel 4, Walking Through History, Frontline Dorset, and is day 3 of a 5 day walking guide which can be downloaded free. On the path down past the farm, heading towards the Second World War radar station. The Radar Station. There is no access to the bunker, the entrance is gated and locked. The small illustrated board on the fence gives some information. The bay was quite deserted apart from a few dinghies moored.